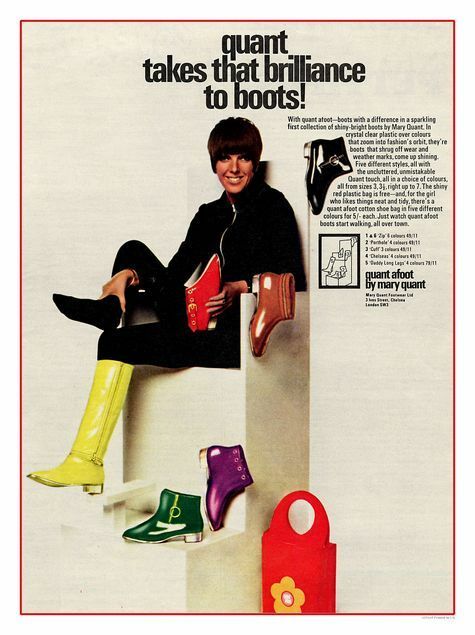 Quant Afoot Boots by Mary Quant advertisement, 1960s. The red plastic bag in the advert- I had a holiday job in the Summer of 1967 (what a great year that was!! ), and it involved attaching the plastic handles to the bag itself using a machine which melted the bits to each other. I made 1000 a day for 5 days a week for 5 weeks totalling around 25000 units. Where are they all today? Chris what an amazing story!!! Have you seen the movie Made in Dagenham? It’s a true story about some female factory workers who went on strike in 1968 and has many Mary Quant references. I remember 1968 very well and, yes the dispute at Fords in Dagenham at that time- it was the precursor to the Equal Pay Act in the UK. Happy Happy Days. Incidently, the Mary Quant shoes were made in Bristol UK by GB Britton and Sons- my Mother was workings as PA to the Advertising Manager and met Mary Quant on many occasions- wish I’d kept some of the bags now! !